The drone video presents you with mesmerizing views of Manhattan, New York. The skyscrapers of Manhattan have been covered in the drone video footage. The drone video presents you with mesmerizing views of Manhattan, New York. Manhattan’s beauty covered from every angle and it just gets drop-dead beautiful when the drone camera gets this close with one of the popular skyscrapers. This is the beauty of the city that never sleeps — the breathtakingly stunning part of NYC. Manhattan is arguably the most affluent locality in the world. These spectacular videos tell us why. Every aspect of the city is covered beautifully with the high-definition cameras installed in flying drones without troubling anyone. These amazing videos will make you feel like a spider-man, hovering from one high-rise to another. When the drone flies over the Atlantic Ocean displaying Manhattan skyline on the horizon, that’s the one of the awesome scenes one can ever witness in reality. Just have a look at this place yourself! There’s difference in capturing the Manhattan skyscrapers from every angle. It is only possible through the drone camera & here you are viewing absolutely amazing video of the New York City from an elevated position. You will find the glittering streets in this Manhattan drone footage from above, and you instantly know why New York is an alpha plus world city. 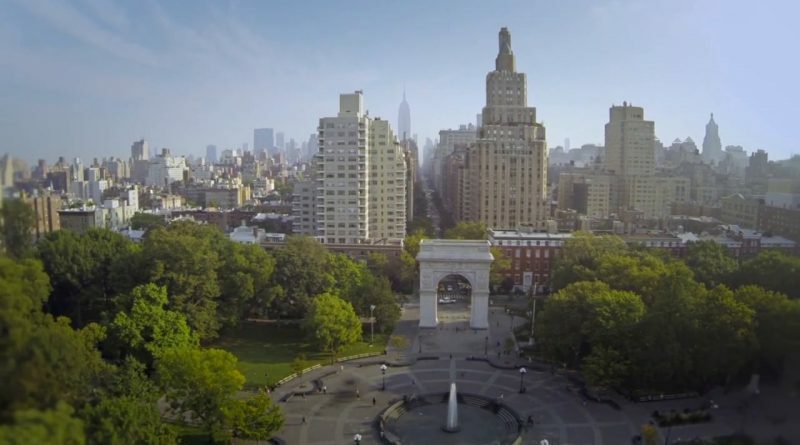 This New York drone footage has just captivated the senses! Incredible views of the city that never sleeps, with a catchy soundtrack to boot. It takes supreme talent to fly down the narrow avenues of #NYC like this – Randy Scott Savin captures some of the most well-known sites of the city from above, including Grand Central Terminal and Washington Square Park. When the drone passes through two skyscrapers, you actually get to see the New York’s large-heartedness. The zooming in and out of the camera covers the every minute detail of the avenues. One can actually feel the warmth present in this NYC amazing footage. The melting pot of all cultures has never been captured so elegantly before. Welcoming everyone — so clean, so civilized, and so developed! Yes, this is New York: the capital of the world. Are you planning to visit the United States? This video will make you pack your bags as soon as you can & off to New York, the gateway to the States.